The Roger Sherman Inn has been a landmark in New Canaan since its construction in the 18th Century. Following public debate over its planned sale and redevelopment in December of 2016—an effort that eventually stalled—the business’s owners have seen locals rally behind the restaurant and inn during the past 18 months. Now, owner Nes Jaffre said, she’s focused on breathing new life into the business, with a new and popular chef already hired and $160,000 in renovations planned for this year. Plans include $160,000 in interior renovations. 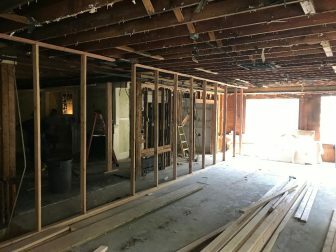 The town on July 19 issued a building permit to remove walls, convert three current dining rooms into one space for banquet use and install new French doors to an outdoor deck while extending the porch. Jaffre says the changes are designed to help attract more interest for events such as weddings. “Our sole purpose of this is to be able to seat up to 220 people in one room, which is really necessary for larger scale occasions,” she said. The remodeling is timely, as another popular large-scale venue in town, the Country Club of New Canaan, recently came offline for a major renovation. According to Jaffre, the hiring of “Iron Chef” competitor and Forbes magazine-featured chef, Francois Kwaku-Dongo also is central to the Roger Sherman’s business strategy. 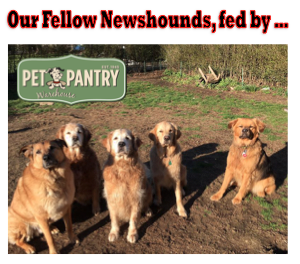 “Our new chef is all about catering,” Jaffre said. 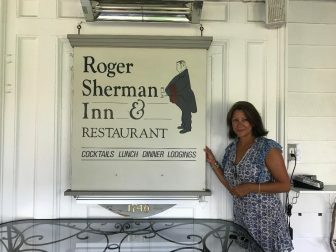 The changes come after a whirlwind year for the Roger Sherman Inn, after a plan for its sale and development of the land into a cluster of townhouses fell through. Still, all the new work and renovations are worth it for Jaffre. I am very pleased to see all the new developments at the Roger Sherman. To me, it is a real gem and we are so fortunate in New Canaan to have a genuine historic landmark here. At the same time, and maybe it is not right for the Roger Sherman, is the lack of connection to the same history. Visiting Gadsby’s Tavern in Alexandria or City Tavern in Philadelphia, you are not only sitting in a historic site, you feel like you are having a unique dining experience that 99% of other places can not offer no matter how good the menu. These places provide history in the atmosphere, the service, and the food and drink all–of which is 4 star quality. Good duck is good duck…but I want to try George Washington’s favorite duck recipe and sides cooked according to his recipes in an Inn he might haven eaten the same meal at. Maybe, while drinking his recipe beer. Who and where better to do so than our own historic inn? In case anyone is wondering, that is not a new wall in the photo (with studs 48″ on center!). It is a temporary support pending installation of a steel I-Bar to help open up the space. As of yesterday, the I-Bar was in place.